In early March, Washington sent a new ambassador to Azerbaijan that was appointed by the sitting US president Donald Trump personally. As it’s been revealed by a number of media sources, Earle Litzenberger is a career member of the US State department that used to occupy the position of the senior advisor in the Bureau of political-military affairs within this government body. He has also been known for occupying the position of senior fellow at the German Marshall Fund of the United States. 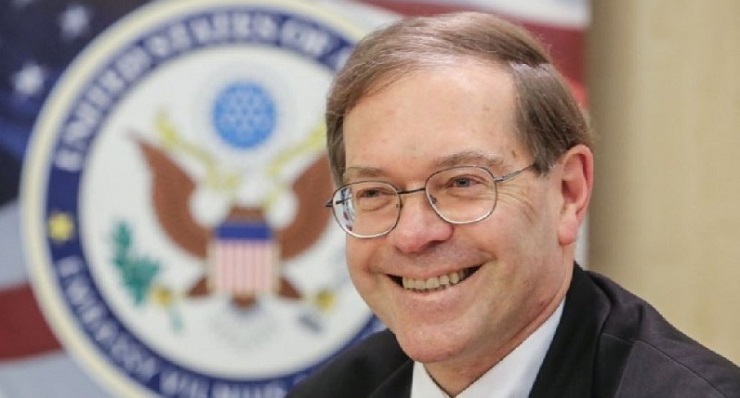 Prior to that, he used to serve as the deputy chief of the US mission to NATO, deputy senior civilian representative to Afghanistan within NATO, deputy chief of the US embassy in Belgrade and deputy chief of the US embassy in Bishkek. If one is to take into consideration the fact that Litzenberger has a strong military background, he would be puzzled over the fact that such a figure was to be appointed US ambassador to Azerbaijan. Yet, things would become much more transparent when the fact that Washington has made a number of fruitless attempts to launch a color revolution in Azerbaijan is taken into consideration. Indeed, every election season in this country is associated with the Western media trying to persuade the local population that it’s the time to launch a mass protest movement that would ultimately result in every aspect of the political life in Azerbaijan getting subjected to Washington’s will. Moreover, there’s a matter of Caspian oil that Western monopolies have been dreaming to get their hands on for a long while. So it’s no coincidence that a new election season in Azerbaijan is approaching, as the voting is due to take place sometime in 2020. The bilateral relations between the United States and Azerbaijan saw a major uptick during the terms of Bill Clinton and George W. Bush. In the 1990s, the former US presidential adviser on national security, Zbigniew Brzezinski would travel to Azerbaijan to personally deliver private messages to the local political elites from the US president. The ultimate goal behind this trip was drive a wedge between Baku and Moscow, that enjoyed good friendship within the framework of the allied states in the post-Cold War period. Yet, Brzezinski would also try to drive Azerbaijan away from its another former ally – Armenia and it must be added that to a certain extent he was successful in this quest. In a bid to test the waters, Brzezinski would propose developing energy cooperation between the United States and Azerbaijan, the scenario that would hurt both Moscow and Baku itself economically but would make Western oligarchs really happy. Even though back then there was no official rhetorics about the “harmful energy dependence of Europe on Russia,” Brzezinski would be ahead of its time in advertising Western energy independence from Moscow. Gradually, Azerbaijan would become a principal player on the European hydrocarbon market by agreeing to export its oil via the Baku–Tbilisi–Ceyhan pipeline. Today it is also engaged in negotiations on the construction of South Stream pipeline, which would transport Caspian gas to Europe. In addition to cooperating with the West in hydrocarbon production, Baku has recently begun providing extensive support to the US coalition forces in Afghanistan, while publicly manifesting its own intention of strengthen its economic ties with a number of Western countries. However, in 2010 the bilateral relations between Washington and Baku took a noticeable dive once the Obama administration made an attempt to “normalize” relations between Turkey and Armenia, to the detriment of Azerbaijan’s interests. To a large extent, this shift in Washington’s policies became possible due to a strong pressure applied by the Armenian lobby in Washington on American political elites. Almost three decades after the vote of independence, Azerbaijan represents a fairly successful state that is capable of pursuing its own international and domestic goals, consistent with its own national interests. In spite of the tensions in the Nagorno-Karabakh region, Azerbaijan managed to develop its national identity and transform itself into a powerful international player. However, in recent years, the United States and its European satellites have grown vocally critical of Azerbaijan and its policies. Just like in any other region of the world, Washington is unable to stomach the fact that the political leadership of Azerbaijan pursues its own independent policies and will be able to pocket the profits from its booming oil and gas trade with Europe, instead of turning them over to Western monopolies under the supervision of the United States. Therefore, the expectations that the Baku-Tbilisi-Ceyhan and Baku-Tbilisi-Erzurum pipelines would land Azerbaijan in the Western camp, transforming it into a Caucasian equivalent of the present-day Baltic republics, Moldova, or the fascist-riddled Ukraine have all but failed. The West cannot find joy in its heart while observing the rapidly improving ties between Azerbaijan and Russia, especially in a situation when these ties transform into a mutually beneficial military cooperation. In addition, Washington has started to rap its head around the fact that Azerbaijan has voluntarily assumed the role of Turkey’s younger brother, and as tensions continue flaring between Washington and Ankara, there’s no doubt that Baku would be more happy to support Tayyip Erdogan than Donald Trump. However, it seems that Washington has had enough of Turkey and Azerbaijan and is now going to make them pay an incredibly high price for their disobedience, especially in the light of Ankara acquiring Russia’s state-of-the-art S-400 air defense systems in spite of the massive outcry voiced in this West over this fact. Therefore, through various official and secret channels, the so-called sole superpower is going to try make it clear to Baku that should it be continuing such policies in the future, it will be treated extremely harshly in the West. That is why Washington spares no time in staging a drastic activization of the opposition forces within Azerbaijan that it has been sponsoring all along. Predictably enough, the so-called National Council of Democratic Forces would launch rallies under a variety of pretexts, starting with the violation of human rights in Azerbaijan and ending with corruption claims. But if in the past, Ilham Aliyev had to take restrained criticism from the mainly non-governmental entities, now he must brace for a full-scale color revolution. It seems that Uncle Sam decided that it was about time to replace him with a more “democratic” government that would have a better understanding of the chain of command that exist in the Western world. It’s no coincidence that the Azerbaijani currency – manat has recently taken a major hit and keeps falling down rapidly. It is impossible to make any definite predictions in modern geopolitics, but it’s safe to say that the Aliyev regime is heading into troubled waters, and Earle Litzenberger would make sure that it’s not going to enjoy this trip.